Part of the Glenstone Estate Museum in Potomac, MD. All 16-acres are managed organically under the leadership of Paul Tukey. 1. Get a soil test. The information that this test provides can help ensure that you are doing all you can to promote your soil’s health. Healthy soil, in turn, provides the best long-term benefits to your lawn. The magic number? Somewhere between 6.5 and 7.0. Getting your soil’s pH level within that ideal range is a key factor to how lush your lawn is. And a soil test tells you how to get there. Call your county extension service for the soil test kit and additional information. 2. Clean up. I prefer to have a clean surface to work with before I add any product to my lawn. Thatch, leaf debris, and weeds can prevent soil amendments from making their way on or into the soil. A stiff rake and a little bit of elbow grease is usually all it takes to prep the lawn surface. Collect what you scratch up and add it to your compost. 3. Aerate. A clean surface also paves the way for the probes of a tool called a core aerator. This piece of equipment extracts plugs (cores) of soil from the ground. These extracted cores relieve soil compaction by allowing more room in the ground for root expansion, oxygen exchange, and drainage. The small holes left behind after aerating also collect and hold soil amendments or fertilizer in place. 4. Feed the soil. Nearly all grass types (centipedegrass and buffalograss are two common exceptions) are heavy feeders. I use two main products. And unlike synthetic fertilizers, both build soil health while feeding the lawn naturally. For most yards, that can quickly exhaust your homemade compost supply and likely an impractical option for buying bagged compost. Instead, find a reputable bulk supplier that offers “STA Certified Compost.” This designation represents the Seal of Testing Assurance, which is issued by the US Composting Council. * Products carrying the STA designation have been analyzed for ten important criteria of quality compost. Milorganite: When it comes to bagged fertilizer, this is my go-to, especially for lawns. It’s an organic, non-burning, slow-release nitrogen feeder with iron. Milorganite** works well at building a healthy lawn with good green color, and improves soil health, too. It features excellent consistency of its ingredients, is readily available, and is easy to apply with a rotary or drop spreader. 5. Mow and water less. Use the techniques listed above, and you’ll end up with a lush, green lawn- yes, one that requires periodic mowing, but not too much. 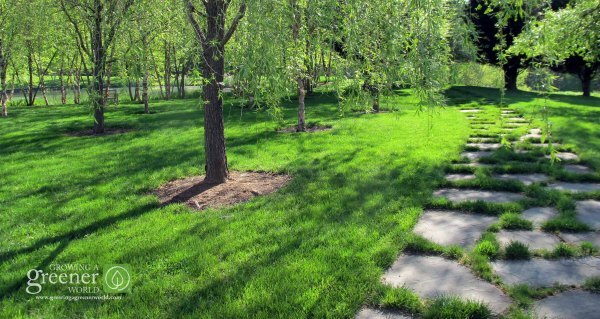 In an organic lawn maintenance routine, you allow your grass to grow to the upper height of its preferred range. This will result in more vigorous turf with deeper roots and fewer weeds, as taller blades will shade and outcompete weeds vying for the same space. What do you think? Do the long-term plusses of organic lawncare outweigh the instant gratification of synthetics? I’d love to hear your thoughts on managing your lawn organically- why you do… or why you don’t. What’s the biggest challenge? I’ll respond to as many comments as I can. *Disclosure: At the time of this writing, I am the spokesperson for the US Composting Council. **This is also a sponsored post. Although the thoughts and opinions in this post are indeed my own, the company(s) who sponsored it compensated me in some way to write it. Rest assured that I only accept such offers when I genuinely believe in a product or service, use it personally, or believe it to be good information worth sharing with my audience. Thanks Steve. I’m glad you found it useful. We appreciate the feedback. Hi Joe. Love the show and site – you’ve helped and inspired us tremendously, and this fall we will begin installation of a gated veg garden in our yarden. So FWIW, thank you. The soil test resonates with us. Our yarden has soil that I believe to be rich in mineral content, but is hard pan clay, and I believe, very alkaline. We have some large patches of grass that have yellowed, and we have (for a limited time I fear) a 4″ caliper pin oak with iron chlorosis so bad the top half of the tree is dead, including the leader. So, after my soil test I am anticipating a high ph, to go along with the hard pan. I’ve been searching far and wide for a quick way to neutralize the ph, but haven’t found a solution, other than trucking in ‘super soil’ from our local supplier (it’s a blend of shredded soil, mushroom compost, and other organic matter). I was thinking of asking them to blend in some pine fines if the ph turns out to be as high as I suspect is the case. What do you think of this? Any other suggestions? And what do I do with all the synthetic stuff gathering dust in our shed? Thanks again Joe, awesome show! Hey John. Thanks for the kind words! Regarding the synthetic stuff, contact your local municipality and see if they have an annual or periodic “hazardous waste disposal day”. If so, you can take it then and know it will be responsibly disposed of. Otherwise, keep working out from where you live, town/city, county, etc. until you find a place that will take it now, or during designated days. But I’m glad you asked. Don’t just throw it away or dump it elsewhere. I know you won’t but this is advice to others. Regarding your tree issue, it could be a number of things. I really don’t think a high pH number would kill the tree but I do think soil compaction could easily be the culprit. It’s very hard to improve compacted soil. The best you can do is to aerate the surface with a core aerator and then topdress with compost. Also, if you really want to do all you can, you could consult with a “Certified Arborist”. They may suggest a core fertilization program or something else that uses equipment to get deep into the soil to improve nutrient flow, water filtration, etc. But it’s hard to say without a on-site analysis and soil analysis. Adding new soil to the top as you are inferring won’t hurt but I would first determine the core issue. I think you need to open up space in the existing soil as mentioned above first. then fill with the good soil you are suggesting. We had a nesting pair of bluebirds in our bluebird box, but last week after a couple of days of inactivity we found the male dead on the nest with three eggs under him. There were no discernible wounds (as from a house sparrow), so pesticides in our neighborhood may have been responsible. The female was nowhere to be found so we buried the male and his nest with the no longer viable eggs. We are on a mission now to get our neighborhood to go organic. Thank you for your excellent info. neighborhood towards organic. Thank you and good luck!!! I love gardening and seeing things grow. I have a small apple orchard, 53 trees, and I have to use some sprays. However, all the rest of my yard and gardens are spray free. I have lost my bees and need to get more or ask friends to put some hives on my land. During the very bad winter last year, I lost three peach trees and a cherry and some new trees planted the year before. Trees are so expensive, I doubt I will replace the peaches, but I will miss them. We used to have many peach trees but back in the 70s bad weather killed so many that we gave up with peaches and only grew a few trees. I should look for hardier trees, but I am getting old and probably can just go to the pick your own that are around here. I enjoy reading the posts and the articles, but I am not familiar with the TV show as I do not watch much TV. I am a garden writer and president of a large Ohio garden group, which keeps me busy. Hi Peggy. I sympathize with you. It’s tough to lose trees especially. As for the TV show, even if you don’t watch much TV, all of our episodes are also available for viewing from our website. There’s an “Episode” tab right in the top main menu. Just pick a season and scroll to see all our offerings. Hi Joe, another informative read, thanks! Do you happen to put rock dust down on your lawn by chance? I don’t . Since the soil in the lawn area is “native” it already has a lot of mineral in the form of sand, silt and clay. Prior soil tests have confirmed I’m in good shape with the minerals there. However, part of the reason I test my soil is to find this information out. If I was lacking, this would tell me what and I would adjust accordingly. My main place for mineralizing my soil is in my raised garden beds that are heavy on the organic amendment side, but lack a lot of the needed minerals. Hope this answers your question. If not, let me know. We saw your show on spraying compost on lawns a couple of years ago. We live in coastal NC, have sandy soil and our lawn is centipede grass. We actually spread the compost manually and have seen a vast improvement in the grass. Haven’t used commercial fertilizers in several years because we want to make our yard bird and animal friendly. Thanks for the tip on using the compost. Will look into the Milorganite fertilizer. I live in a small town in Northeast Ohio. I would like to switch to an organic lawn care program. I don’t have a large lot, and it is a historic neighborhood with old lawns. I am a woman in my late 50′ s and am not inclined to apply treatments and fertilizers myself. We have a company in the Cleveland area called Good Nature that is an organic lawn care company. It is quite expensive; I believe their program includes 7 visits/applications. I’m wondering what the thought is on organic lawn care companies. Are they generally reputable? Or am I going to be wasting my money. Also, I just purchased a cordless, electric Kobalt mower. I really wanted a reel mower, but I am told I would not be able to push it through taller grass; and I need the leaf mulching capabilities anyway. Any thoughts on cordless mowers? It has great reviews. Thanks so much and I love your program and getting your newsletters! Hi Leslie. Thanks for your nice comments. Since I do all my own organic lawncare management, I don’t have any personal experience with organic lawncare companies. However, I am sure there are multiple ways to vet them out. I did check out their website though to learn more. They use products I suspected, like natural corn gluten to fertilize and provide some pre-emergence weed control. They also offer a product to outcompete weeds using micro-clover. It can work and reduce the need for more fertilizer. But it’s still considered a weed by many. It’s personal preference. So the bottom line is, I certainly can’t endorse this company but they do seem to be doing many but not all of the methods I would use for maintaining a lawn organically. You may also investigate if there are any competing companies in the organic lawncare category in your area. It would be interesting to compare what they use. If you have more questions, respond to this post. Thanks Leslie, and good luck with your search. I am checking out a company in Copley Ohio called Kid Safe Organic Lawn Care. But the more I look at your steps, the more I think, perhaps I could do this myself and save some money! I want to protect my wildlife…and my grandchildren! Thank you for your reply! Good for you Leslie. I don’t deny there’s work involved. But, I really get a great sense of satisfaction in knowing I’m taking charge of what goes on and into my lawn and landscape. It’s the only way to know for sure you’re doing all you can to protect it for wildlife and your loved ones. So far, I haven’t found a way around the work of filling the bags of product into the spreader, clearing the lawn, etc, there is much to say from the satisfaction that comes from doing this work myself. I imagine it will be the same for you. Plus, not only are you doing good for all that you care about, you’re doing good for you! The exercise from your efforts can’t be denied. So embrace all the good that comes from your efforts. Joe, so I went to the OSU Extension Office website for my county and I will be ordering my soil test kit. 2. The clean up part I love…raking, thatching, cleaning up the leaves that came down after snowfall, etc. 3. I spread compost and fertilizer 4. Don’t cut too short and cut less often. RIGHT? So…no weed control except pulling, right? I can do this! The electric cordless mower I ordered is not going to be available until at least August. I have about 3200 feet of yard (with lots of English ivy, 1/2 block of hedges to trim, old trees. It’s pretty flat. Two more questions…. how do you feel about reel mowers? There is a hardware store in Amish Country that sells a reel mower that is suppose to be suited for the Amish women who take care of their yards. It’s close to $300; but I’m thinking about getting it. Thanks again! You have been a big help to me as I have struggled with these issues for awhile now. Milorganite is not excepted by organic standards because of the human waste that is in it. If you check a bag out you will not see the organic seal on it..
Hi Michael. Perhaps this will clarify a couple issues for you. Milorganite is certified by the United States Department of Agriculture (USDA) as 85% biobased product because it is derived from renewable materials. It complies with all federal and local limits, allowing it to be used for all of your fertilizing needs, including for use on vegetables. However, while the product is perfectly safe for use on vegetables, Milorganite is considered to be an organic-based fertilizer, but is not approved for use on USDA certified organic produce. For my purposes, that’s just fine. And to clarify a common misconception, there is no human waste in Milorganite – it is heat-dried microorganisms. Go to “What is Milorganite” to learn more and research on the safety of using Milorganite on vegetables. In our business I try to use organic, but sometime we have customers that just won’t listen. Then I do my best to keep their lawn and flowerbeds looking as nice as possible. I feel that organic is so much better for our enviroment. like to know if the products talked about will be okay for this type of grass ?? Hi Brenda. Kudos to you for trying to steer your clients towards organic options. People are so stubborn sometimes! In answer to your question, Buffalograss is a low maintenance species with low fertility requirements. One to two pounds of slow-release nitrogen per year, which is what an application of Milorganite will provide, applied during the growing season, is the most it requires. Buffalograss can be prone to iron chlorosis (yellowing), the iron in Milorganite will help to prevent or remedy this problem. Lastly, it’s also great to use in conjunction with seeding since its non burning formula will provide the nitrogen and phosphorus the young seedlings need to thrive without burning (dehydrating) the plant. As we have introduced bees to our suburban homestead we use less and less processed fertilizers and pesticides and in the process have been learning about all kinds of native plants and their uses that we used to just call weeds. With manure and mulch we still have a green lawn that uses less water and less mowing plus expanding former flower beds to vegetable and fruit production. The best part is several of our neighbors are ‘buying in’ to the process thus making more and more of the neighborhood more self sustainable, and what a good feeling to teach (not necessary preach). That is awesome George. I love everything you said, and especially your approach to leading by example. Sometimes people just need to see before they will believe, right? Thanks for sharing this.